One of our most popular tours, which we refer to as "just magic" is an in-depth tour with an emphasis on history, the palaces and the people of India. Travel with us through two countries as you cross thousands of miles of fascinating culture. This program is designed for those who are first timers to the continent who wish to enjoy a leisurely paced tour with loads of value added sights not normally found in other tour programs. 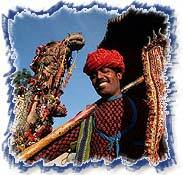 The Magic of India & Nepal is yours to discover with the experts. Arrive Mumbai. On arrival at the airport, you will meet our representative and be transferred to hotel. Overnight in Hotel. Morning visit Elephant caves which is located 10 km away from the Gateway of India at Mumbai. These caves house huge rock cut temples dating back to the 5th century CE. 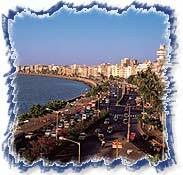 Afternoon leave for city tour of Mumbai which includes the British-built arch "Gateway of India," Mumbai landmark; the Hanging Gardens and the affluent community of Malabar Hills; the Prince of Wales Museum, Dhobi Ghat, Marine Drive, and the Gandhi Memorial. Evening connect train # 7057 Devgiri Express dep. 21:05 hrs. Overnight on train. Arrive Aurangabad at 04:10 hrs. After wash and change leave for tour of Ajanat Caves. Ajanta Caves are 106 kms from Aurangabad and date back to the 2nd century BC. The 30 rock hewn caves are adorned with Buddhist sculpture and the frescoes portray in epic from the religious and secular life through eight centuries. (Ajanta Caves are closed on Monday's). Drive back to hotel. Morning visit Ellora Caves (29 kms) encompassing 34 rock cut shrines representing Buddhist, Hindu and Jain art dating from the 4th to 9th century A.D. The most remarkable among them is the Kailash Temple, meant to be a replica of Lord Shivas celestial abode- Kailash is the best example of Rock cut architecture and an engineering marvel. (Ellora Caves are closed on Tuesday's). Afternoon city tour of Aurangabad visiting Aurangabad Caves, Daulatabad Fort, Bibi Ka Muqbara etc. Overnight at hotel in Aurangabad. Late evening transfer to railway station to connect train # 7058 Devgiri Express dep. 23:30 hrs. Overnight on board. Arrive Mumbai at 06:00 hrs. Later connect flight IC 472 dep at 15:15 hrs arrive Udaipur at 16:25 hrs. Upon arrival transfer to the hotel. Overnight stay at hotel. Morning leave for city tour visiting City Palace, Jagdish Temple, drive around Fatehsagar Lake, Sahelion ki bari (Queen's resort for her friends) and Bhartiya Lok Kala Mandir (Folk art museum ). Overnight stay at hotel. Morning transfer to the Airport to connect flight 9W 3301 dep at 08:20 hrs arrive Jaipur at 09:25 hrs. Upon arrival transfer to the hotel. Afternoon leave for city tour visiting City Palace and Museum. Nearby is the ornate Hawa Mahal (Palace of winds) which is five stories high and is decorated with delicate screens carved from stone. Also visit Jantar Mantar Observatory, which is still equipped with immense, brick and mortar instrument. Evening you may explore the Colourful local markets of Jaipur by own. Overnight stay at hotel. Morning visit Amber Fort on elephant back / Jeep. Amber Fort was the ancient capital of the State. Visit the Sheesh Mahal or the Hall of Victory glittering with mirrors. Afternoon drive to Bharatpur (175 kms / 4 hrs). Upon arrival check in at hotel. Overnight stay at hotel. Morning enter into the Bharatpur Bird Sanctuary for a silent ride on bicycle rickshaws to view the migratory birds from all over Asia. Afternoon drive to Agra (55 kms / 1 hr). Enroute visit Fatehpur Sikri the deserted, red sandstone city, Emperor Akbar built that as his capital and palace in the late 16th century is an exhilarating experience. Upon arrival check in at hotel for overnight stay. Morning leave for sightseeing tour of Agra visiting world famous "Taj Mahal" the monument of love immortalized in marble. It was built by Emperor Shah Jahan in the memory of his Queen Mumtaj. Agra Fort dominated by red sandstone construction & houses the beautiful Pearl Mosque and other noteworthy structures. Evening transfer to the Railway-station to connect train # 4864 Marudhar Express dep at 21:15 hrs. Overnight on train. Morning arrive Varanasi at 08:15 hrs. Upon arrival transfer to the hotel. Afternoon leave for city city tour of Varanasi visiting Bharat Mata temple, Tulsi Manas, Banaras Hindu University etc. Also visit Sarnath, near Varanasi is the place where Lord Buddha preached his first Sermon. Overnight stay at hotel. Early morning boat ride on river Ganges to see the Bathing & Cremation Ghats. Come back for the breakfast at hotel. Afternoon transfer to the Airport to connect flight IC 751 dep at 12:10 hrs arrive Kathmandu at 13:10 hrs. Upon arrival transfer to the hotel. Overnight stay at hotel. Morning visit Durbar Square, Temple of the Living Goddess and Swayambhunath. 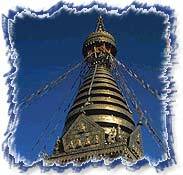 The tour includes visit to the charming towns of Bhaktapur, Pashupathinath and Bodhnath also. Overnight stay at hotel. Morning free for leisure. Afternoon transfer to the Airport to connect flight 9W 261 dep at 14:15 hrs arrive Delhi at 15:45 hrs. Upon arrival transfer to the hotel for overnight stay. Morning leave for sight-seeing tour, which includes visit to Jama Masjid - the largest mosque of Emperor Shahjahan. Later proceed to Raj Ghat- cremation site of Mahatma Gandhi, to India Gate - a 42 meter stone arch built in the memory of the Indian Soldiers who died in World War I, Drive past the President's House & Parliament House, Humayun's & the Qutab Minar. Overnight at hotel. Morning transfer to the International Airport to connect flight for onward destination.